If, like me, you love books, then Filigrane is an absolute must! 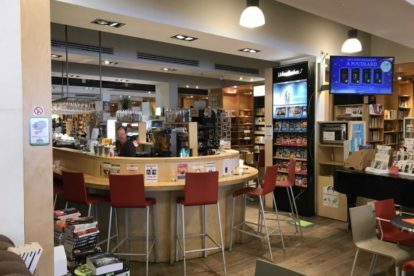 Not only is the place one of the biggest bookshops in Brussels but it also has a comfortable and well-equipped cafeteria where you can slake you thirst and satisfy your hunger. And all the while, you can flip through your potential next purchases amongst the irresistible smell of new books! The large majority of the books available at Filigrane are in French. It does however have a decent English section and books in other languages. I particularly like their Comics and Graphic Novels section, which is a big tradition in Belgium. If you have children, they will not be left idle, as the store has an ample area dedicated to both little ones and teenagers, with books, board games, toys and gadgets. If you are lucky, on one of your visits there might even be an author present to introduce his or her work and engage in a discussion with the audience. Filigrane is the kind of place that makes you forget the passage of time and, if you are anything like me, you will also forget how heavy books are until you are carrying a few of them back home.